Launched by Sennheiser at IBC 2008 in Amsterdam, the MKE 1 will also be highlighted at 125th AES convention, San Francisco. 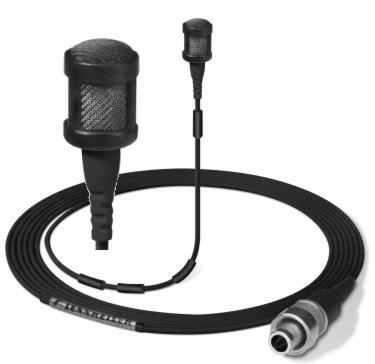 Sennheiser's latest professional clip-on microphone underwent comprehensive field tests to confirm the outstanding sound quality of this compact, professional mike, natural and full with a clear and pleasant treble. Special care was taken to ensure the microphone capsule was fully protected from moisture. The anti-kink sleeve has also been improved in order to increase the life of the Kevlar-reinforced cable. With a diameter of just 1 mm the cable is highly resistant to handling noise while a special plastic coating ensures that it tangles less readily. The MKE 1 comes complete with a multi-purpose cap which protects the microphone from perspiration and also serves as a windshield (treble boost of 1.5 dB). Also included is a small frequency response cap, which ensures a treble boost of 2.5 dB for applications where the mike is hidden within the costume or when more brilliance needs to be added, for example for intelligibility. Three make-up protection caps and several thin plastic tubes for shielding the cable when attaching it with clips or adhesive tape are also included. The MKE 1 is available in beige and black and comes with a special 3-pin plug for the Sennheiser bodypack transmitters SK 5212, SK 5012, SK 250, SK 50 and SK 3063 or with an unterminated cable for use with other transmitters.